Choosing a kitchen range hood is easy! Just follow the steps in our infographic to determine which size range hood you need for the size of your kitchen. Meanwhile, you can also browse our recent blog post 2015 Best Range Hoods as you shop for your kitchen remodel. This entry was posted in Home Improvement, Kitchen Design, Kitchen Tech, Kitchen Tips, Professional Range Hoods, Range Hoods and tagged extractor hood, kitchen, kitchen design, kitchen remodel, range hood, range hoods, range hoods inc on July 20, 2015 by editor. This guest post is by Bill Buyok, the Founder & Owner of Avente Tile. 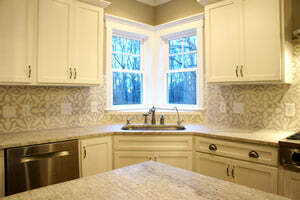 A kitchen backsplash is one place you’ll be looking at a lot while you enjoy your home. It’s also one place that allows you to really emphasize your style. Creating an eye-catching backsplash that reflects your style and taste is easy with tile. Bright colors and bold patterns found in cement tile are used for this patchwork design. The choices and options are endless and range from a traditional fruit-themed mural, multi-colored mosaic, colorful Spanish tile patterns, or a muted bold pattern with cement tile. Consider the style and color palette of your cabinets, flooring, appliances and range hood. Then follow these three important tips that will point you in the right direction to create a winning kitchen backsplash. Don’t be afraid to splurge a little on the backsplash. It’s a small area and one you’ll enjoy almost every day! Decide on the countertop you want first. Then you can start talking tile and backsplash designs. Make sure the two complement each other. Don’t draw attention away from a stunning counter with a busy tiled background. If the countertop is plain or simple, then let the backsplash be the focal point. Here are a few photos that show the “yen and yang” relationship of a counter and backsplash. In the patchwork above, bold colors and strong patterns are placed next to clean white cabinets and counters with stainless steel appliances and hardware. The backsplash is both eye-catching and appealing because the cement tile patchwork is the dominant focal point. Here’s another example of a bold, colorful backsplash that uses traditional hand-painted Spanish decorative ceramic tiles that really catch your eye. A plain counter, in a similar color that is dominant in the tile pattern, doesn’t take your attention away from the backsplash. A bright bold backsplash using Barcelona San Jose 6″ x 6″ pairs nicely with a simple solid-color counter. Alternatively, the pattern in the cement tile backsplash below gets your attention while integrating a bold pattern that works flawlessly with the counter. Bold patterns can often be “toned down” with similar colors, neutral colors or colors without high contrast. A bold cement tile pattern is muted with neutral colors and hues similar to the counter and cabinets. Below, the Indian Teal brown granite countertop takes center stage. The decorative dots of hand-painted Spanish tile and plain field tile are the supporting cast. Work with the available space.You can’t fit 10 pounds of gold into a 5-pound sack. Large tiles with big patterns just don’t work in that tiny wall space behind the sink with a big picture window – no matter how much you love that tile. It sounds obvious; but pictures make it very clear. Find the right scale of patterned tile to fit your space. Above, Cuban Heritage Design 110 2B 8″ x 8″ requires eight (8) tiles to complete both the cross and medallion pattern. It works well for a large wall with no cabinets. The same impact could not be achieved here. There is only 18” between the cabinets and counter. However, decorative tile placed randomly throughout the backsplash and grouped to form a medallion create a warm, Tuscan feel. Notice how the range and the hood meld beautifully with the above cement tile installation. Smaller tiles can be used randomly or grouped to form a medallion. Patterned tile with a border are the right scale for this kitchen. Define your style. A kitchen designer can really help. First, though, try to define the experience you want to achieve, the importance of aesthetics versus “ease of maintenance.” What colors do you like? Do you like clean lines and contemporary designs or classic patterns? Bright colors or muted colors? Vivid colors or earth tones? Consider using Pinterest to collect ideas you like. Not only will you discover a theme that works, you’ll also be able to share your vision with your designer or friend who is helping with the design. If too much pattern scares you, consider “blocking tiles” to create an interest area. As you find your style and look for tile, keep these three rules in mind and you will end up with an eye-catching backsplash that you’ll love for years to come. This entry was posted in Home Improvement, Kitchen Design and tagged Avente Tile, Bill Buyok, grout, home improvement, kitchen, kitchen backsplash, kitchen design, kitchen tile, range hoods inc, tile, Tile Talk on July 15, 2015 by editor. If you’re finally getting around to that kitchen remodel this summer, chances are that you’re faced with a decision regarding the right type of range hood for your kitchen’s makeover. Whether you’re an environmentalist, or just health-conscious, a vented range hood is an essential part of your kitchen in order to keep your air clean and your lungs healthy. Range hoods are made to extract the pollution in the air caused by cooking. Grease, smoke, and harmful gases start to build up in the air with frequent or heavy cooking, and a range hood works to remove polluted air and deposit it outside of the living space or to purify the air before pushing it back out into the room. The way your range hood ventilates the air in your kitchen is dependent on the type of range hood you choose to place in your home. There are two primary types of range hoods: ducted range hoods and ductless range hoods. The type of range hood you choose for your home ultimately depend on several different factors. Does your home already have duct work installed? If not, is installing ductwork an option? If you live in an apartment or another type of rented facility, you may not be allowed to do the reconstruction needed for ductwork to be installed. In this case, a ductless range hood may be the best option. A ducted (or vented) range hood is one that pushes polluted air outside of the dwelling, often through a wall or ceiling. Ducted range hoods normally have a smooth chimney that runs from the base of the range hood into the wall or ceiling, which hides the duct work, and moves to a place where air waste is deposited outside of the home. This wall mounted range hood from Range Hoods Inc features a dual four-speed electronic, touch-sensitive control panel with an LCD display. The range hood has a stainless steel finish and is a great addition to any contemporary kitchen. Unlike most vented range hoods, a ductless range hood does not use duct work. Ductless range hoods use a charcoal filter to clean the air, and then re-circulate that air back into a kitchen. While not as effective as a ducted range hood, this type of ventilation can be used when it is not possible to add duct work to an already existing kitchen. Although ductless range hoods are not as effective as their vented counterparts, they can be much cheaper to install, as they do not require duct work or extensive construction or remodeling. Unfortunately, if you decide to go with this alternative, the filters must be replaced every 3 to 6 months depending on the frequency and volume of debris generated from usage. No matter which option you think best meets the needs of your kitchen, range hoods are an essential part of a functioning kitchen, especially for anyone who spends a fair amount of time over the stove. Don’t risk your health or the health of those around you because your kitchen is not properly ventilated. Invest in a range hood today, and enjoy a better quality of life tomorrow! This entry was posted in Cleaning the Kitchen, Cooking, Cooking with Range Hoods, Filters for Range Hoods, Home Improvement, Indoor Air Pollution, Kitchen Safety, Range Hoods and tagged ducted range hood, ductless range hood, kitchen, kitchen hod, range hood, range hoods inc, vented range hood, ventless range hood on July 14, 2015 by Mila Hose.